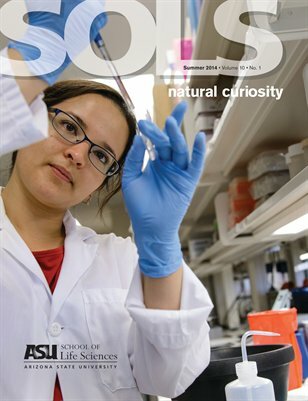 Curiosity is marvelous and it’s alive and well at ASU’s School of Life Sciences. Professor Pierre Deviche wonders why one Sonoran desert bird sings in the rain to find love. Graduate Autumn Moore’s curiosity about squid coloration led her to new work in a marine lab on the Pacific Coast. With inquisitive spirits, graduate students Brett Seymour, Eric Moody and Meghan Duell are among many who travel to Panama to look for answers to questions about bees, butterflies and ants. Also, through a new partnership with Phoenix Zoo, Ben Minteer and Jan Schipper are exploring ways to improve animal conservation. Professor Lawrence Mandarino and colleagues Christos Katsanos, Dawn Coletta, Tatiana Ugarova and Wayne Willis ask tough questions about obesity and diabetes as they search for ways to address these global epidemics. And graduate students Brian Haney and Shelley Valle, to name a few, teach middle school students about science, in hopes of inspiring the next generation of scientists.